Requiem 2: Piano Sheet Music is the companion book to Fariborz Lachini’s recording of the same name. Like the original Requiem, the music is very classically-influenced and structured yet contemporary and sophisticated. Lachini always conveys deep emotion and passion in his music without going overboard, making the music fun to play as well as a rewarding and expressive experience for the pianist. While the eight pieces in this collection are not overly difficult, pianists who are advanced enough to play with expression and depth will undoubtedly enjoy the music more than those with modest skills. (Dynamics and expression are clearly marked.) Although all of this music was recorded for solo piano, the chords are given in each piece for improvisation or even simplification, or to play with another instrument - most likely guitar. 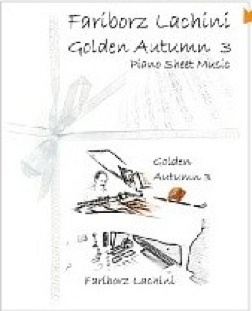 I thoroughly enjoy playing each of the songs in the book, but especially like the grace and melancholy of “Crossing,” which hints of Chopin; the dark and fluid elegance of “Butterfly In Snow”; and the calm yet mysterious feeling of “Flying Dream.” Pianistic fans of Fariborz Lachini will have many hours of enjoyment from this music. Requiem 2 is available for download from lachini.com and the book is available from Amazon.com. Recommended!